Practice and play your favorite music. Playing and practicing piano – anytime and anywhere! 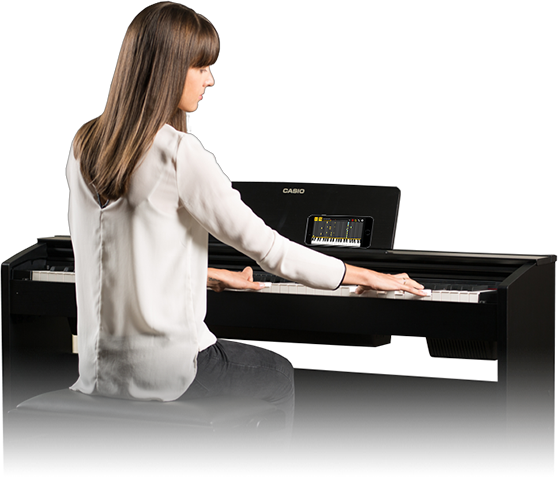 Use an USB cable to connect your smartphone or tablet to a compatible CASIO Digital Piano and enjoy the versatility of CHORDANA PLAY FOR PIANO. 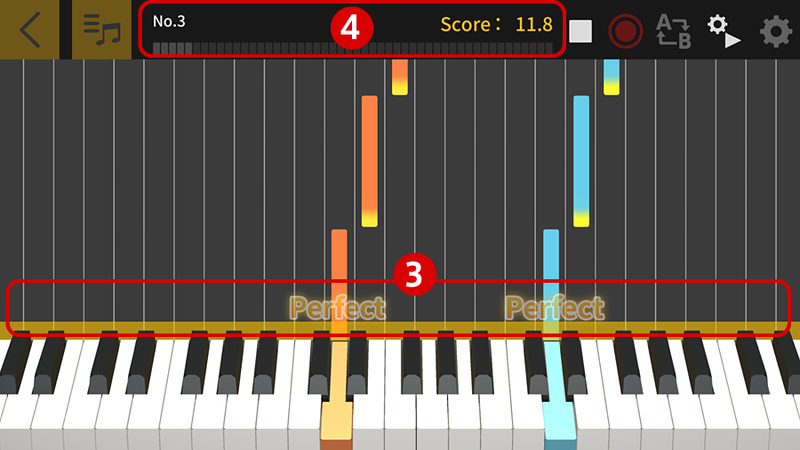 , Practicing is so easy. Select tone, play internal songs and more from the screen on your device. 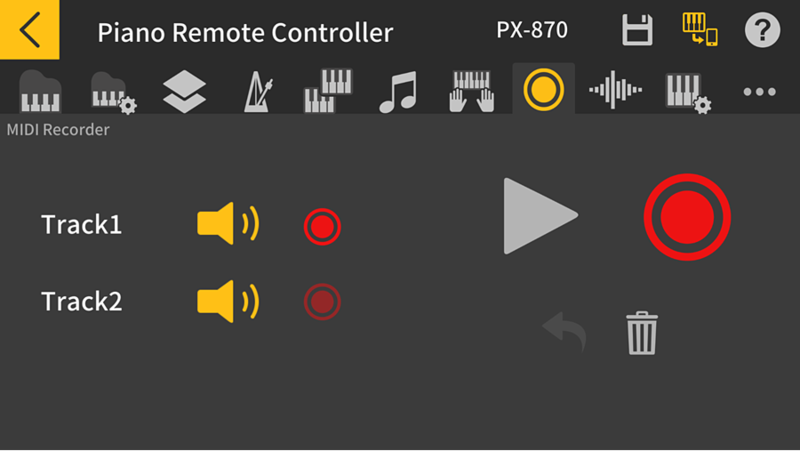 Use the easy-to-understand icons for intuitive control. You can also check settings not directly visible on the instrument itself, such as the tuning frequency readout (Hz) and temperament type. 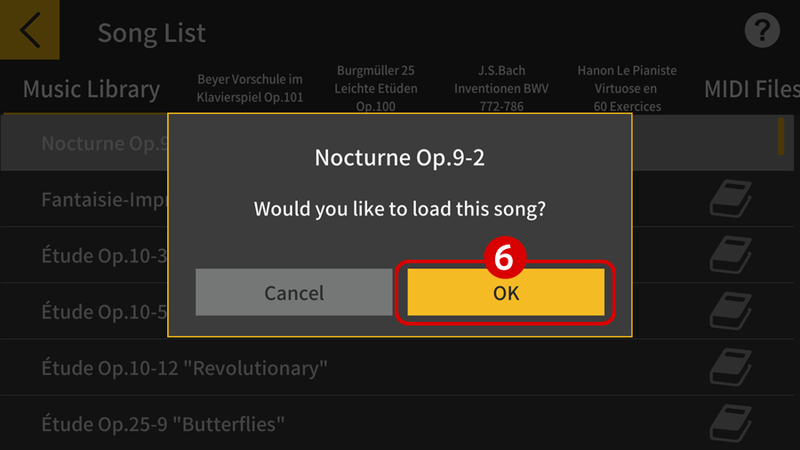 Play songs from the Music Library through the descriptions of built-in songs. Transfer song data from the player screen. Electronic instruments not on the compatible devices list can also be used if they support USB-MIDI. 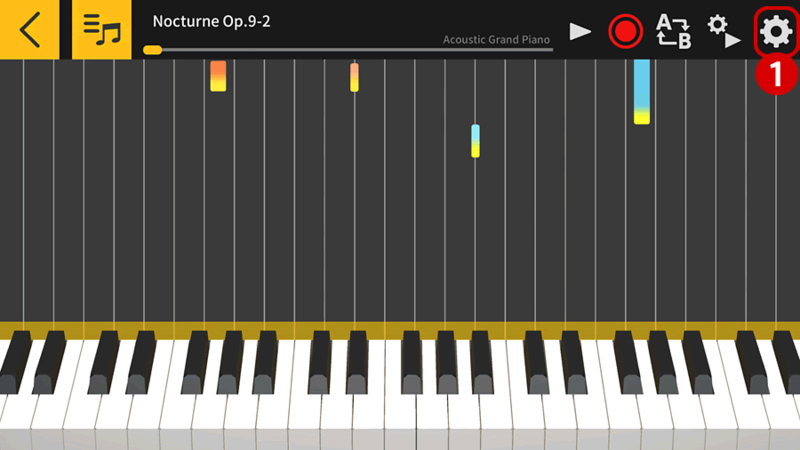 For iOS devices, connect to compatible pianos by means of Apple's Lightning to USB Camera Adapter + USB cable. For Android devices, connect to compatible pianos by means of a USB-OTG adapter + USB cable. Android 6.0 or later is required, although some devices may not be supported. 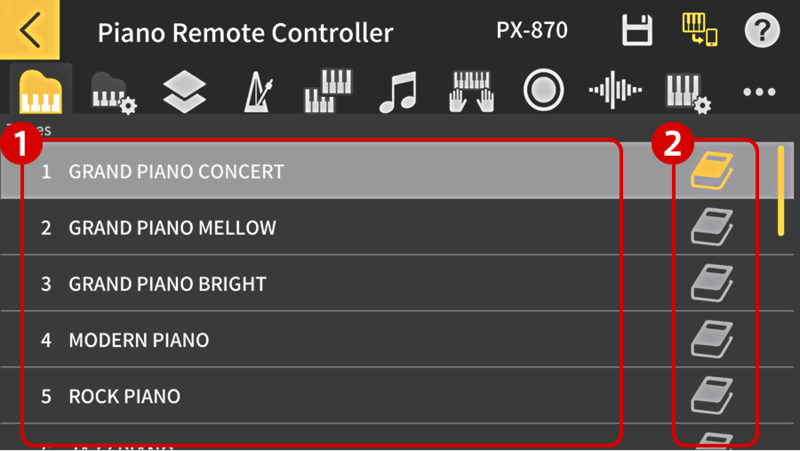 *1: Some settings cannot be controlled using the Piano Remote Controller. 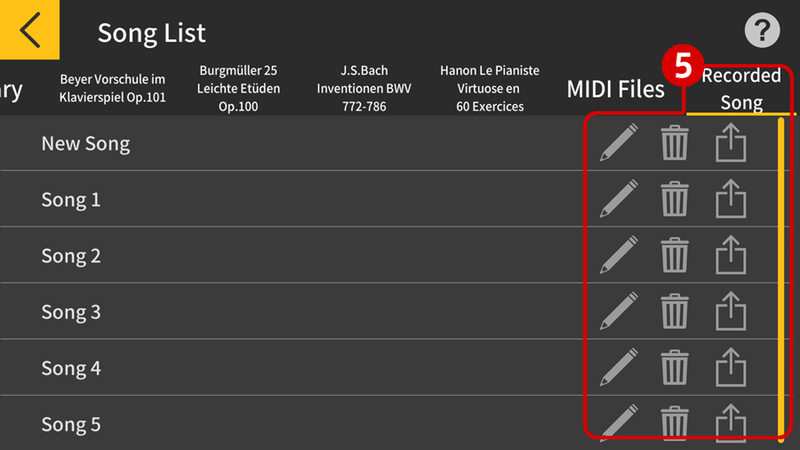 *2: Electronic instruments not on the compatible devices list can also be used if they support USB-MIDI. 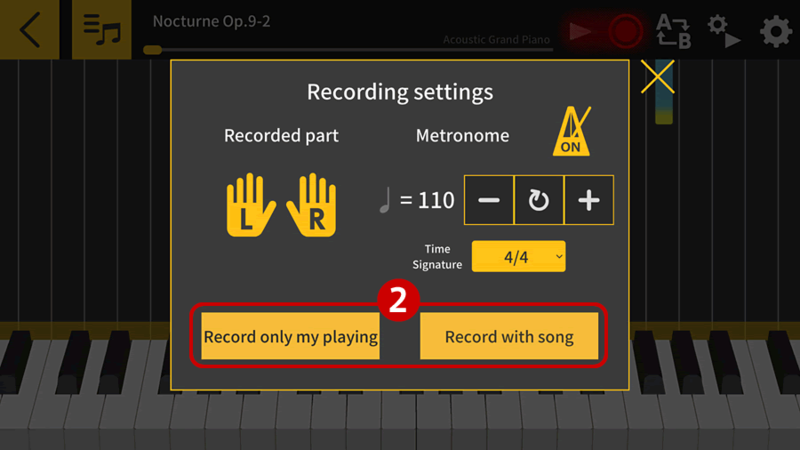 *3: Recording function is MIDI recording. 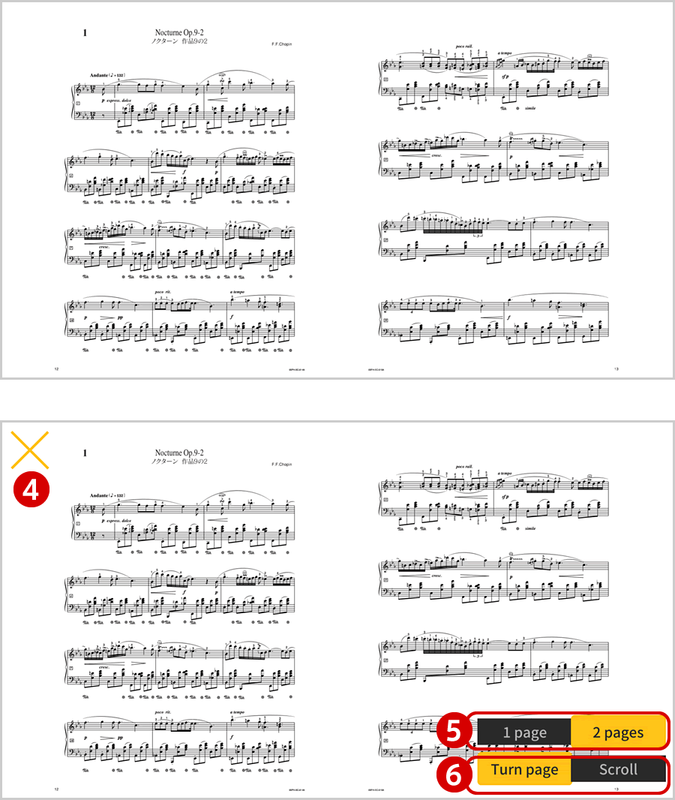 The viewer can display the PDF sheet music of 60 songs in the Music Library. It can also be used as a regular PDF file viewer. 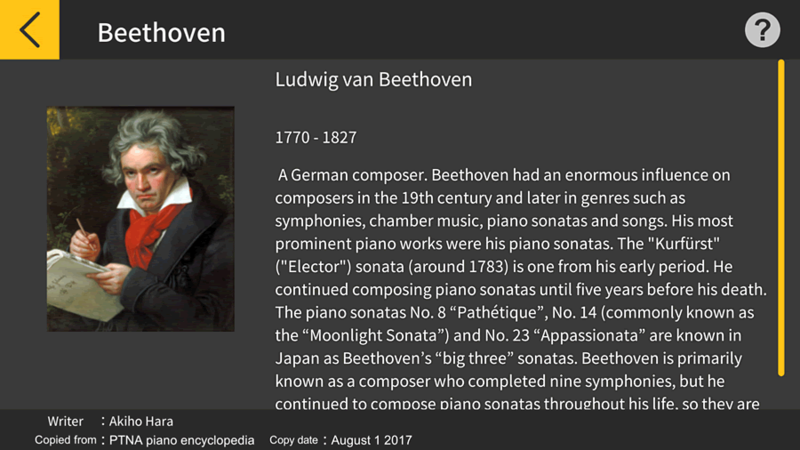 View descriptions of the app's internal songs and corresponding composers. 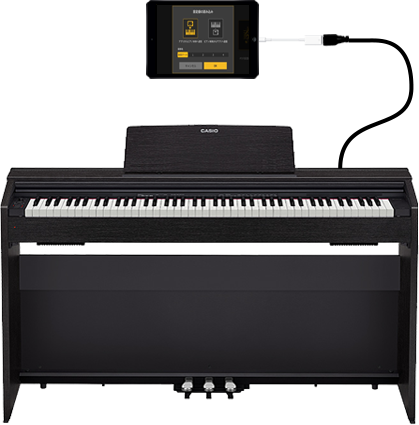 Control playback of songs in the digital piano's internal Music Library when connected to compatible Casio digital pianos. 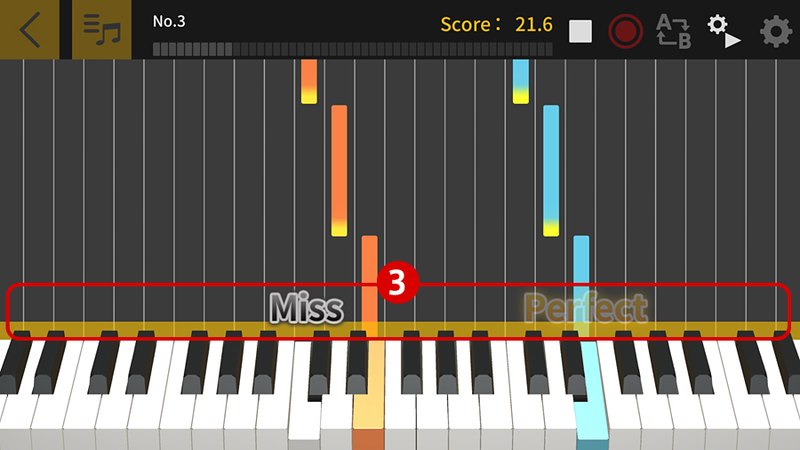 Visually check the next key or keys to be played, and display them in the piano roll window. Practice at your own pace using the tempo adjustment and AB repeat features. 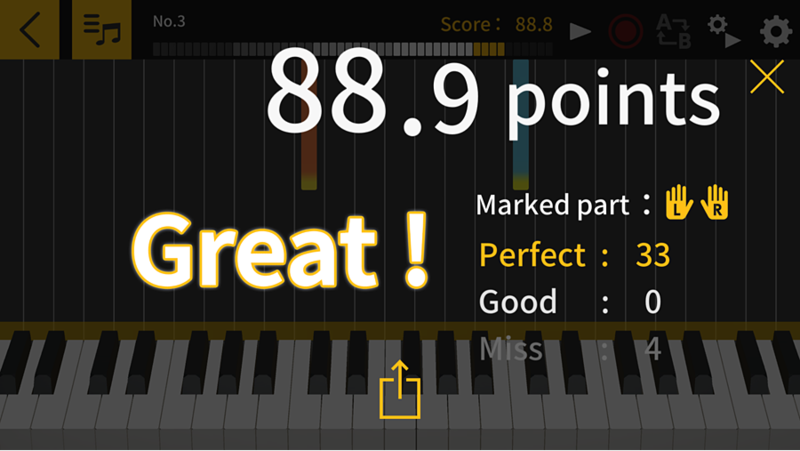 Keep track of your improving skills and make practicing more fun with the in-built scoring system. The app includes a music library with a collection of 60 songs that even beginners can enjoy listening to and playing, as well as Beyer's Vorschule im Klavierspiel Op. 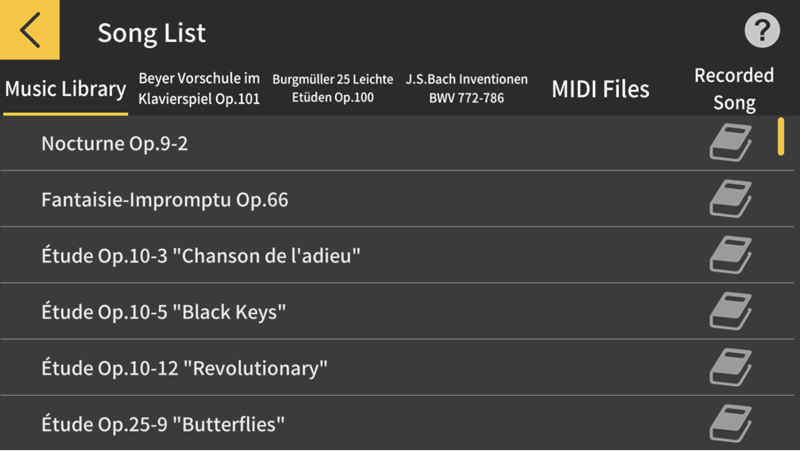 101 (106 songs), Burgmüller's Easy and Progressive 25 Studies Op. 100 (25 songs), Bach's Inventions (15 songs), and Hanon Le Pianiste Virtuose en 60 Exercices (3 songs). 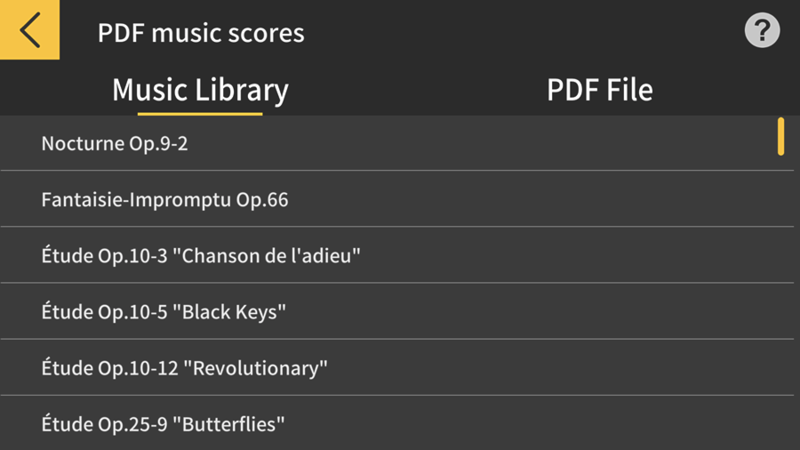 You can also add your own MIDI files to supplement the internal song collection. 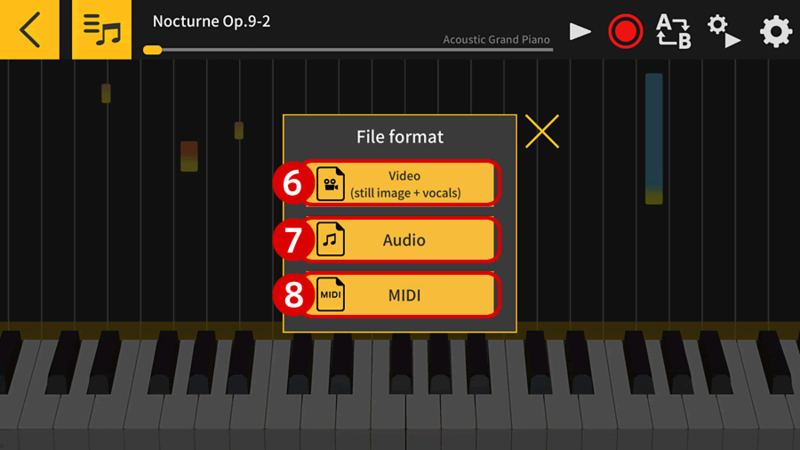 Either search for MIDI files using your smartphone or tablet, or import MIDI files that you already own into the app. Compatible devices Please check if your devices are compatible or not on the App Store. Sold by Casio Computer Co., Ltd.
• Apple, iPhone and iPod touch are trademarks of Apple Inc. registered in the US and other countries. • IOS(iOS) is a trademark or registered trademark of Cisco Systems, Inc. in the United States and certain other countries. • All other service and product names are generally trademarks or registered trademarks of the respective companies. System requirements Android4.4 or later required. Compatible devices Please check if your devices are compatible or not on the Google Play. 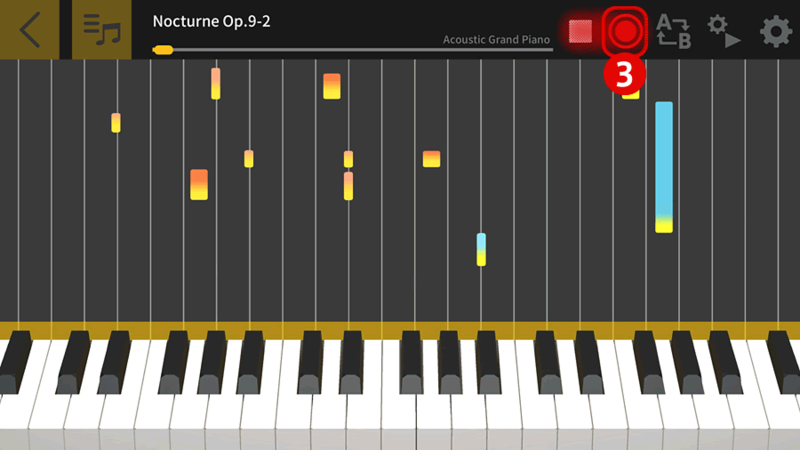 • Android, Google PLAY is a trademark of Google Inc.
Load saved settings from the app into the piano. 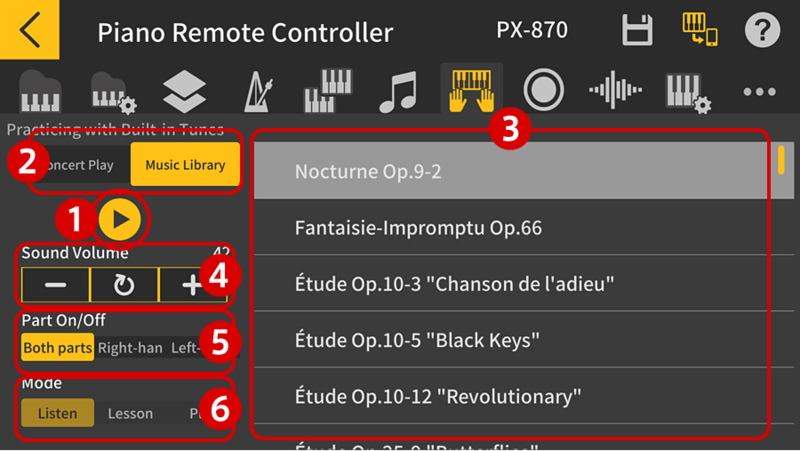 Import settings from the piano to the app. App settings can be imported from the previous session or one of 4 save slots. 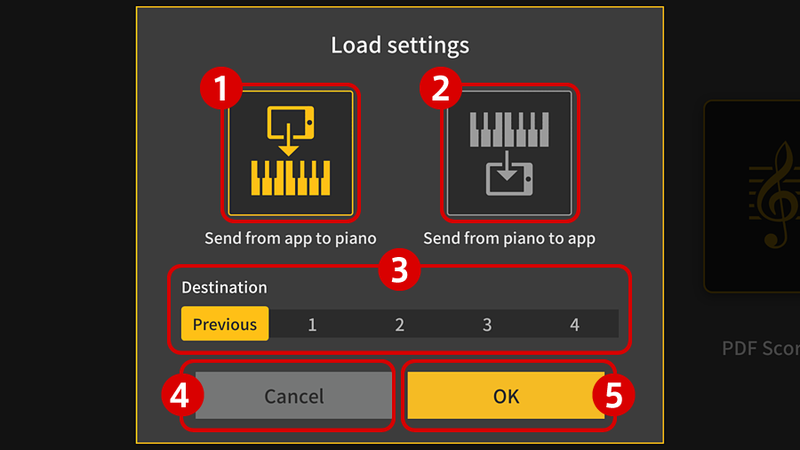 Import according to the selected options to sync settings between the instrument and the app before proceeding to the piano remote controller screen. 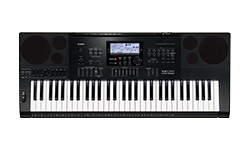 Choosing the keyboard selection's BASS LOWER option alters only the tone of the bass notes (left side) of the keyboard. 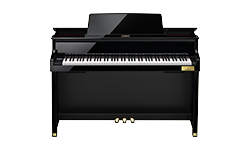 In that case, the mid-range and treble notes (right side) of the keyboard will retain the previously selected tone. 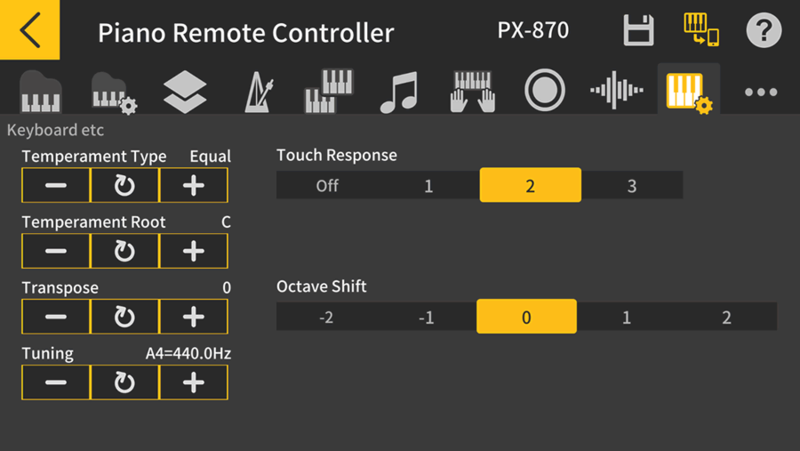 Bring up an explanation screen about the selected tone. 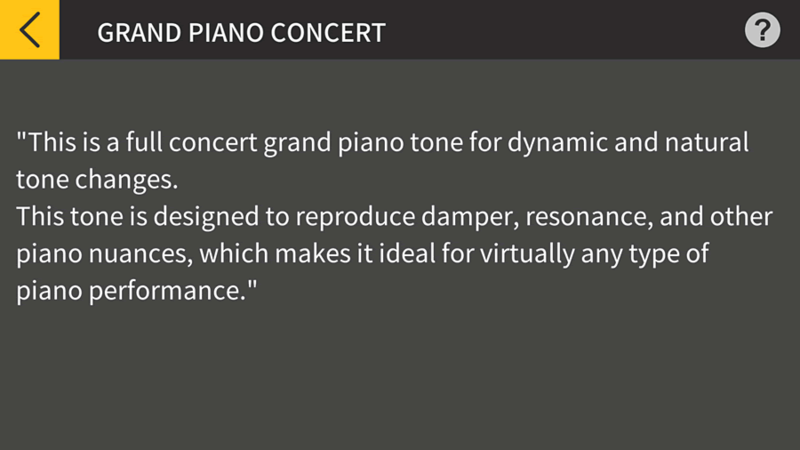 You can simulate the various acoustic responses of world-famous concert halls with differing echoes, from deep and rich to mellow and cheerful. 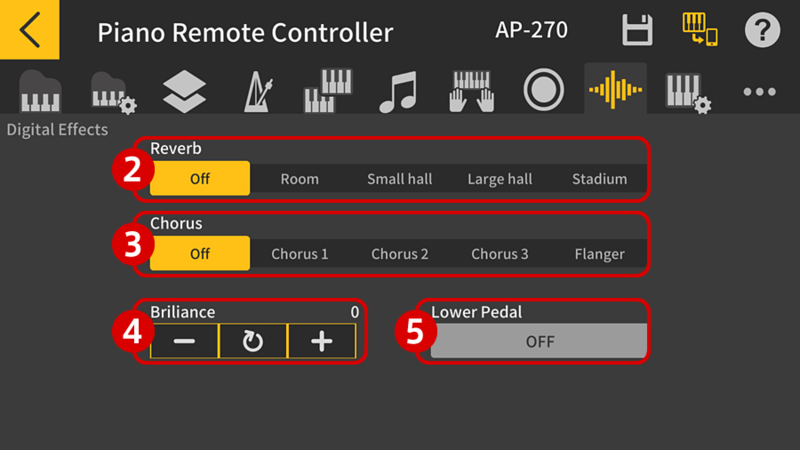 Alter the level of reverb. Alter the amount of chorus effect. Brilliance: Set the brightness of the produced sound. Making this more positive (+) gives a brighter and more solid quality to the produced sound. Making this more negative (-) gives a more mellow and tender quality to the produced sound. Lower pedal: When on, pressing the damper pedal or sostenuto pedal with bass tones selected will apply prolonged reverberation effects to base tones. 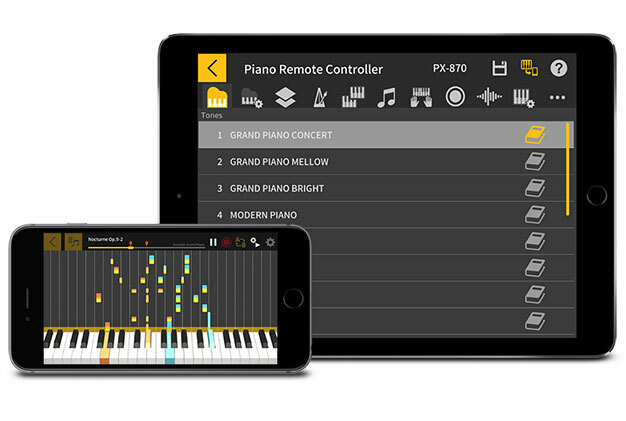 Supported digital instruments have 60 built-in piano solo songs in the Music Library (numbered 1 to 60), and 10 built-in piano and orchestra arrangements under Concert Play (numbered 1 to 10). Play all Concert Play (for listening) songs and all Music Library songs in order on a continuous loop. Switch between Concert Play and Music Library. 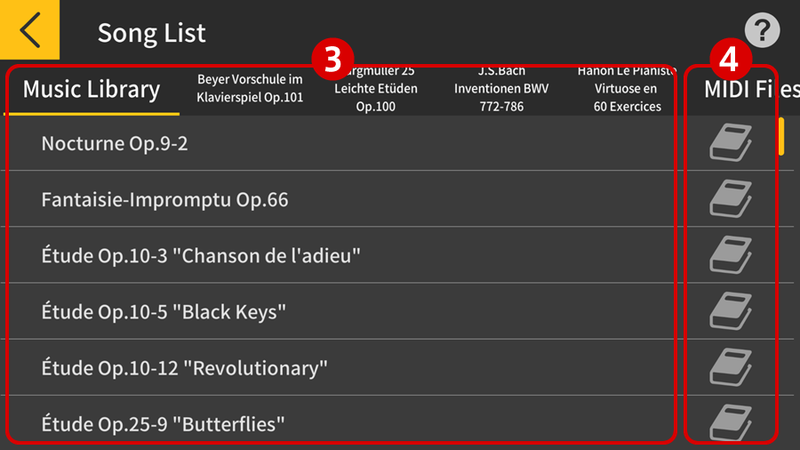 Each time you switch, playback will start again from the first song in the list. Pick a song from the Concert Play list or the Music Library. *Other screens or menus cannot be viewed during playback. Play a song from the Concert Play list or the Music Library. Switch between Concert Play and Music Library. Switch between both parts on, right-hand part off, and left-hand part off. Listen: Listen to the piano and orchestra performance of the song. Lesson: Turn off the accompanying right-hand or left-hand part of the song and practice playing it yourself. Practice the piano part. Play: Play with orchestral accompaniment. 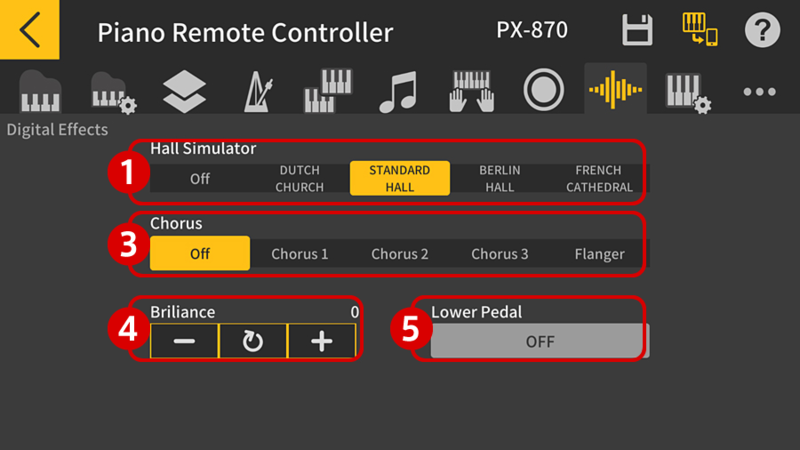 You can record performances on supported instruments with the built-in MIDI recorder and listen back again later. A recorded performance is stored as a track, and there are two tracks in total. Select the track to play. You cannot simultaneously turn off both tracks. Select which track to record to. Record: Pressing this button (when it has not already been pressed) puts the app into a recording standby state. 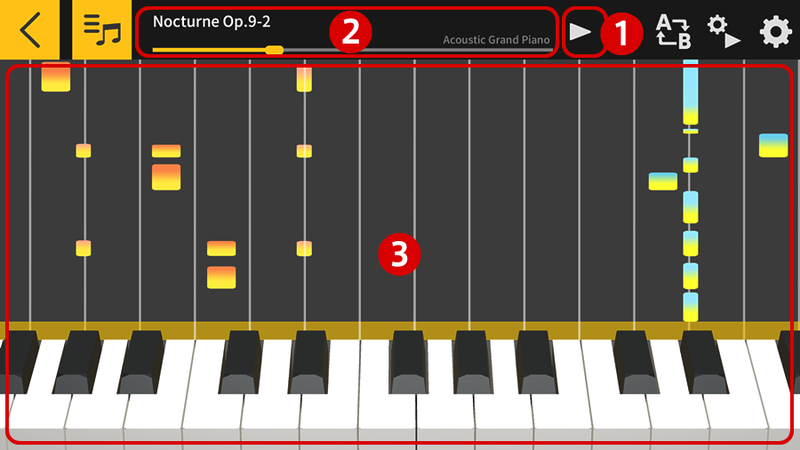 From this state, recording begins when you press the play button, or when you start playing on the instrument keyboard. Play: Pressing this button (when it has not already been pressed) begins playback. Select either Music Library or PDF Files. 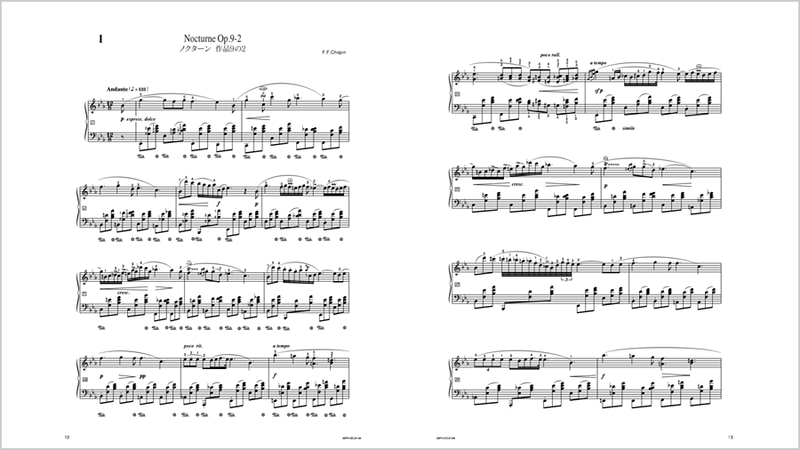 Select the musical score (PDF file) you'd like to view. Return to the PDF music scores screen. Select either song title or composer. Pick the song or composer you're interested in. 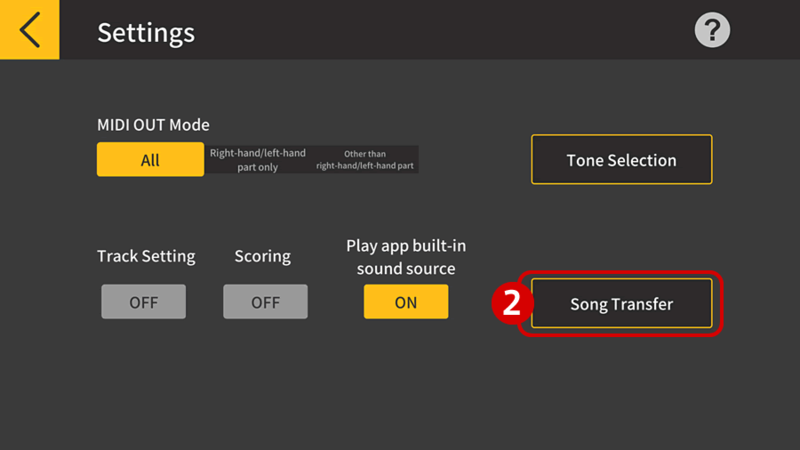 Play the internal song on a connected compatible device. Bring up the song selection screen. 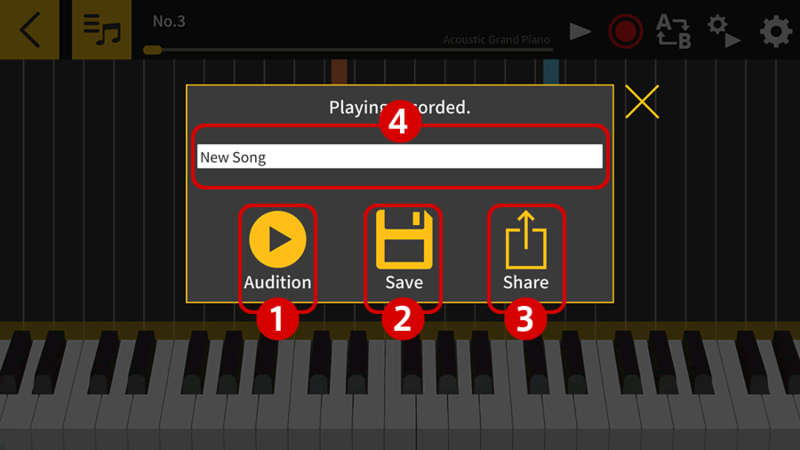 Tap a song name on the list of internal songs, MIDI files, or recorded songs to play it. View descriptions of built-in songs. Change the name of a recorded song, or delete or export the song. *MIDI file playback supports Type 0 and Type 1 formats. 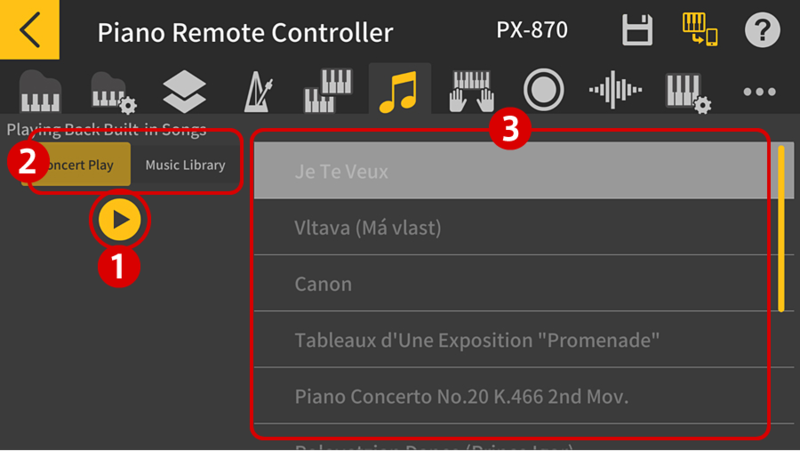 *With Type 1, up to 32 tracks can be automatically converted and imported. Tap the [OK] button to import the song. Tap to play or pause the song. Shows the position within the song. Tap or swipe in the area when the song is paused to change the location in the song. 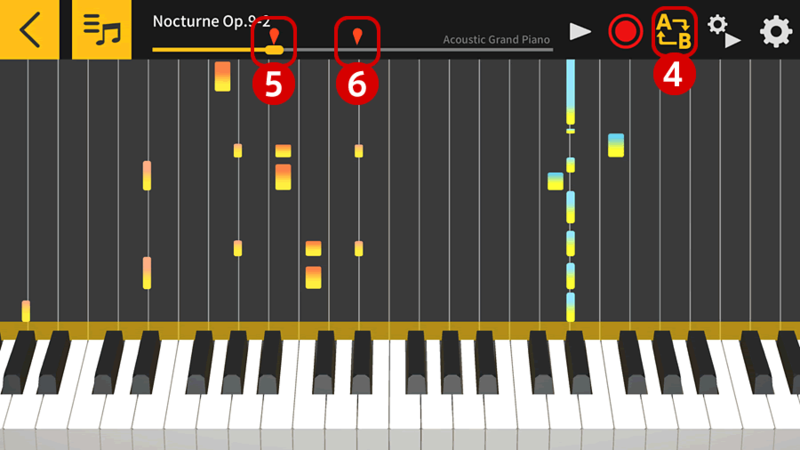 Swipe up or down in the piano roll window to move backwards or forwards through the song. Tap the AB Repeat button. Tap to set the start location (A) for the section to play back. Tap or swipe in this area to set the end location (B) for the section to play back. Tap the [Song Transfer] button. Check the tempo of the song to be transferred. *255 is the maximum possible tempo when transferring songs. 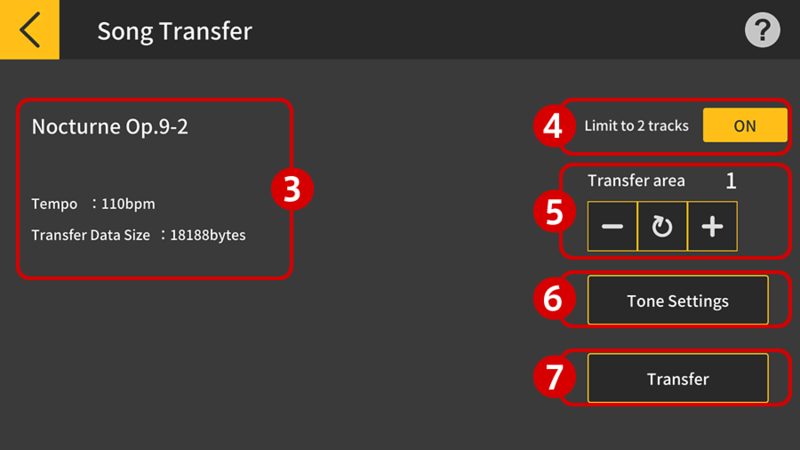 [2 Track Limit] When transferring songs, the number of tracks is restricted (right-hand and left-hand parts only). [Tone Selection] Alter the tone of the instrument's sound. You can specify "mute" or "solo" for each track. If any track is set to play solo, the mute option is disabled and only that track will play. If no tracks are set to solo, all un-muted tracks will play. Specify the right- and left-hand parts. 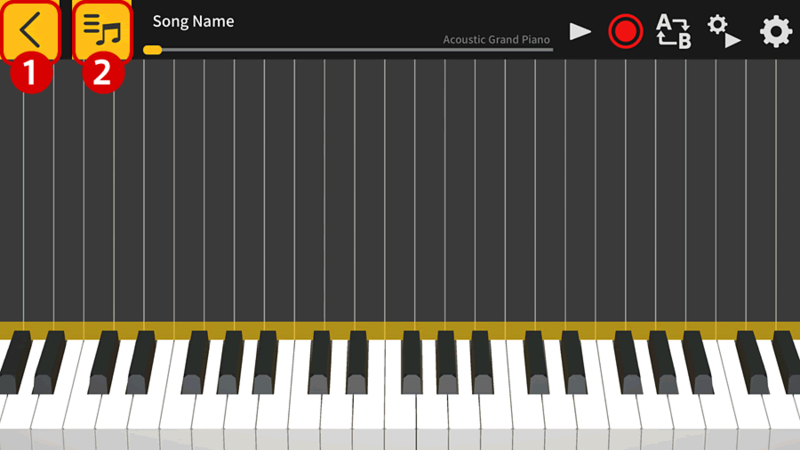 Tap the tone name to perform with that tone on the virtual keyboard. 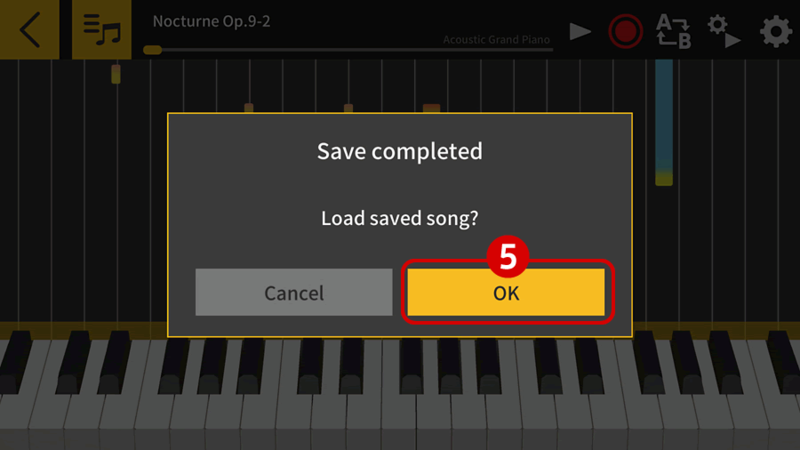 Even if you've selected a song, record only your own playing without using it. When a song is selected, this option records only your own playing while listening to the selected song. 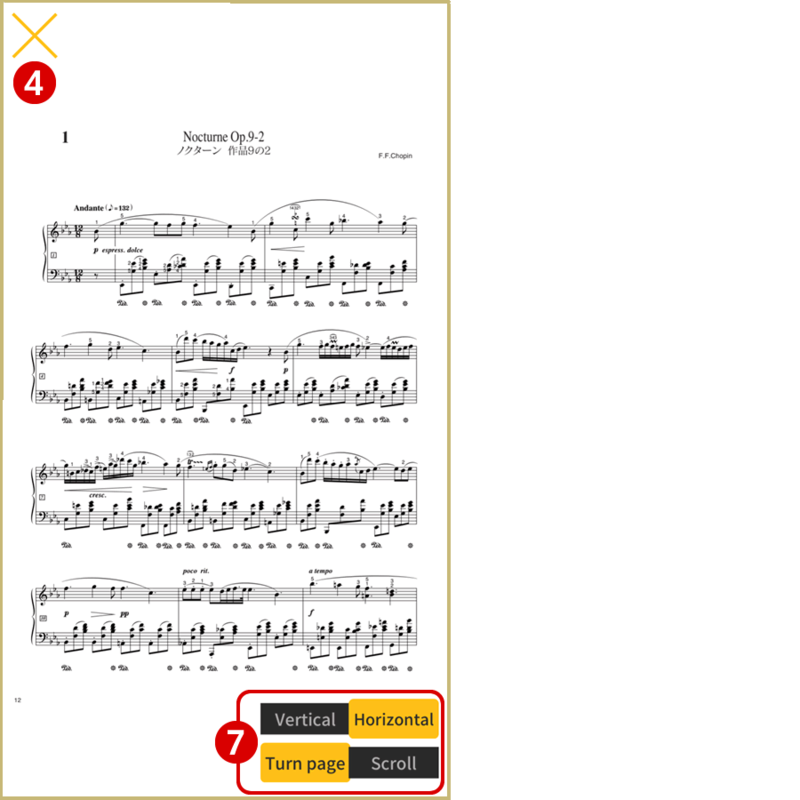 *Some of the internal songs contain other parts in addition to the right-hand and left-hand parts. 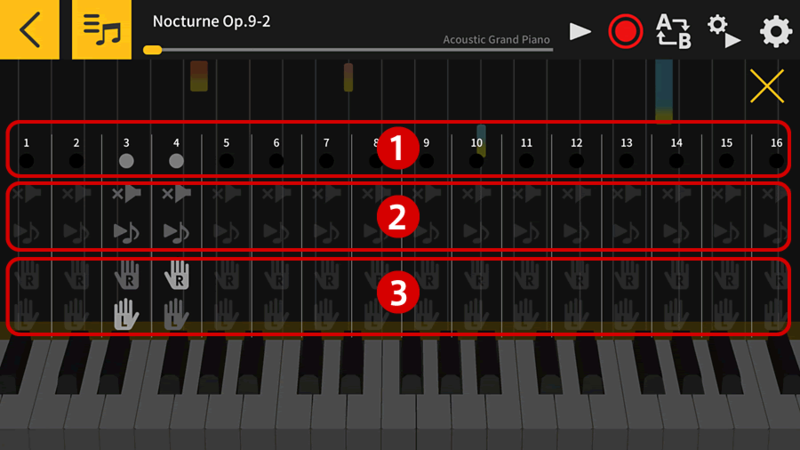 You can record by playing on the app's virtual keyboard, or via an attached digital instrument. 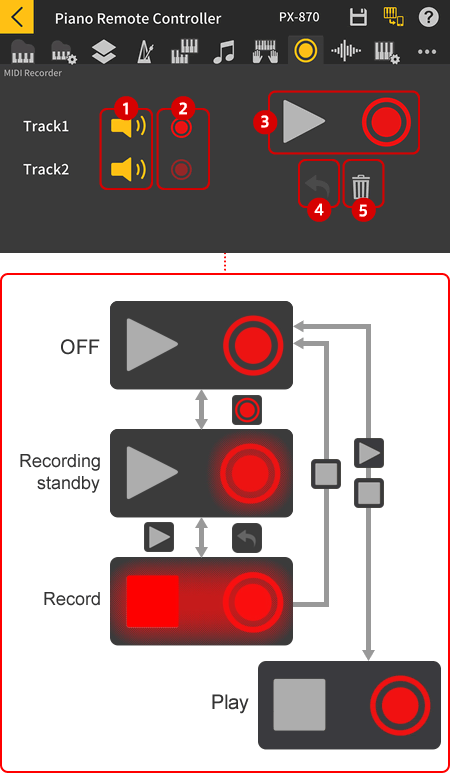 Tap the [Record] button to stop recording. [Audition] Preview the recorded performance. [Save] Save the recorded performance. [Share] Export the recorded performance. [Textbox Area] Enter the song title when saving. Press [OK] to import the saved song, or [Cancel] to go back without importing. Generates a movie file*1 *2 from the recorded song and exports/shares the file. You can then upload the movie to YouTube or save it to your computer. *To upload files to YouTube, you must have a YouTube account. Exports/Shares the recorded song as an audio file*2 *3. This lets you send the song as an email attachment. Shares the recorded song as a MIDI file*4. *1: MP4 format The file extension used is ".mp4". 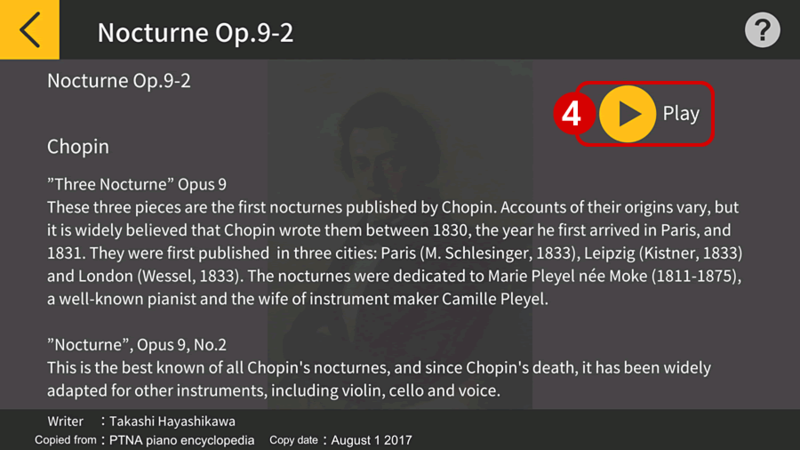 *2: Played by a sound source built-into the app. *3: In iOS, the file extension for the AAC format is ".m4a". On Android devices, the file extension for the WAV format is ".wav". 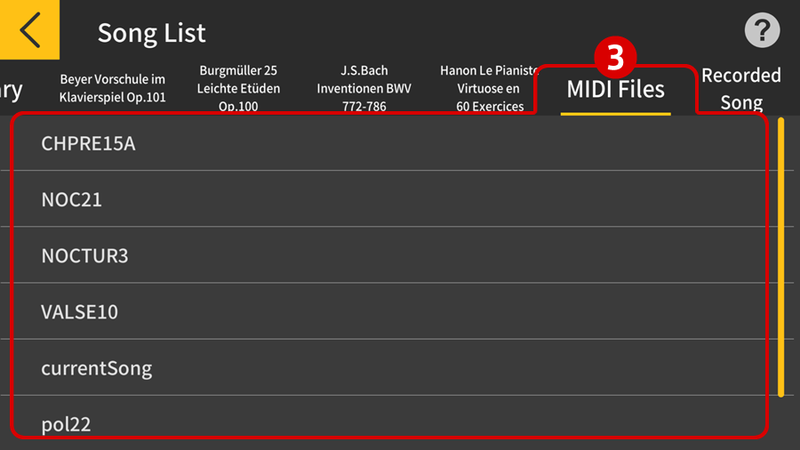 *4: Standard MIDI file. The file extension used is ".mid". Select the song you'd like to perform and then turn on [Scoring] via the settings screen. Press [Play] to start playback. 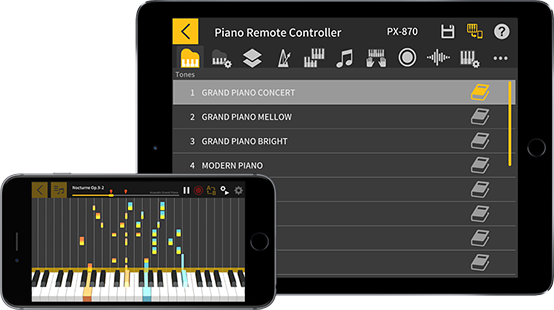 Your performance on the virtual keyboard or attached digital instrument will be assessed, and "Perfect," "Good," or "Miss" will be displayed. You can check your score as you play through the song. After playing to the end of the song you'll be presented with the final results screen, where you can check your overall performance. If you like, you can upload your final results to social media.